I’m sure we can all agree that memes are pretty great. 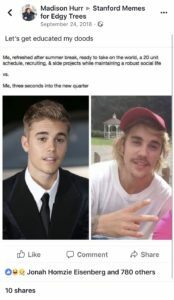 Especially for us college kids, memes can be a source of stress relief, a procrastination aide and an outlet for the struggles of everyday life as a student. I know that it always makes me feel better to learn that I’m not the only one who loathes Axess or spent three hours whining about my Marriage Pact results. 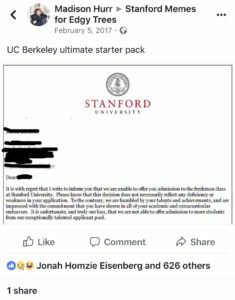 In the past few years, meme pages like Stanford’s have been growing significantly. 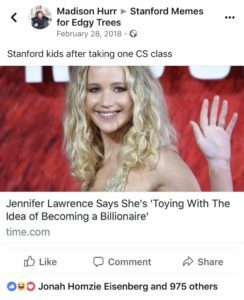 Stanford’s own meme page has reached almost 30,000 members as of the start of 2019, and Berkeley’s sits at just above a shocking 190,000 (we can win the Axe as many times as we want, but their meme page is admittedly superior). And these pages are popular for a reason. It can be therapeutic just to see how many others are feeling the same way you are. College meme pages make it easy to commiserate with thousands of your peers (and to relentlessly make fun of business school bros). They’re also outright hilarious. What’s not to love? What I’ve learned from making— and enjoying others’— memes is that the keys to meme success are to know your audience, be timely and keep it concise and clear. Memes with niche humor or strange references oftentimes go unnoticed and unliked – and for memes, there’s no worse fate. Try to appeal to the broadest group possible, and make sure your references are widely known. If you’re out of ideas, try one of these topics for guaranteed success in the Stanford meme page. Rules shift only slightly as schools change (i.e. if at Berkeley, it’s always safe to laud boba, hate on Haas or poke fun of EECS). 1. Make fun of how it seems that ~90% of our peers sell out and declare a major in Computer Science. Alternatively, make fun of how STEM students are supposedly allergic to the humanities. 2. Tell everyone how stressed you are. Everyone is stressed at Stanford, and people love telling others how much more stressed they are than everyone else. Bonus points if you include a pop culture reference. 3. If all else fails, roast Berkeley. In reality, nobody really cares about our rivalry, but it’ll be bound to rack up a few hundred likes if you don’t mess it up too badly. Contact Madison Hurr at mnhurr ‘at’ stanford.edu.